Beta-glucan is a safe, natural fiber molecule extracted from the cell walls of yeast and other substances, resulting in supplements that better your immune system. Beta-glucan is being researched by scientists all over the world. Their research has revealed the many benefits of beta-glucan. Not only does this safe supplement work with the immune system to help kill cancer, but it works with other drugs helping to overcome cancer as well. Beta-glucan makes your immune system smarter. 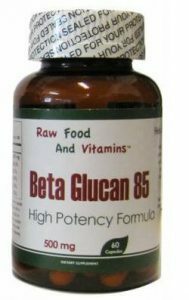 Unlike other drugs, beta-glucan does not stimulate the immune system. Rather, it activates or modulates the immune system. In other words, echinacea and colostrum are substances that stimulate the immune system, but beta-glucan activates the immune system. This way beta-glucan never over stimulates one of the many reasons it is so beneficial. Beta-glucan enhances the production, the size, and the functions of the ¨good¨ cells to carry out the war against bacteria, viruses, fungi, and microbes. There are many sources from where beta-glucans derive: yeast, seaweed, mushrooms, oats, barley, and the list goes on (up to 1500 sources). Even though it comes from yeast, beta-glucan is an isolate, where all potentially harmful proteins are removed so those who are allergic to yeast will not be negatively affected. Now that you know what beta-glucans are, it’s important to understand the difference in sizes and their benefits. Be sure to always look for beta-glucans that have small particle sizes (one to two microns) for the best absorption as many low-quality glucans contain large particulate sizes that tend to clump together once ingested. Along with the information provided here, do your own research to ensure beta-glucan is right for you.